Things were tumbled, oxidized, polished yesterday. And now there are at least 12 new pieces ready to put together today. Annabel is home 'sick' although she is bustling about. 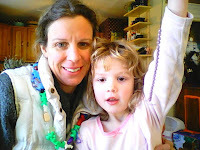 Getting ready to make a necklace with her very own stash of beads. I am sporting a necklace she found, although she 'didn't make it.' And she would remember something like that. She is the finder of lost things and the memory keeper around here. Here she's got a string, all ready to go! Where did all of those wrinkles on me come from?